The average women’s waist size increased 1.5 inches over the past decade. Women’s waistlines have increased whopping 1.5 inches in just over a decade, according to new research published in JAMA last week. What’s more, women in their 40s, saw an increase, on average of 2.5 inches over the same study period. Researchers from the Centers for Disease Control and Prevention (CDC) used national surveillance data from more than 32,000 U.S. men and women from 1999-2012 to base their findings. The results are worrisome because reams of research reveal that larger waistlines equal shorter lifespans. Waist circumference is a measure of belly fat, including the deep visceral fat that is linked to increased risk for heart disease, type 2 diabetes, metabolic syndrome, asthma, breast cancer and much more. If your waistline measures 35 inches or greater, you’re considered “abdominally obese,” even if you’re not overweight or obese based on a scale or BMI measures. And Ideal waistline for women is up to 32 inches. But don’t rely on sham products that claim to create “Fab Abs in 10 Days” with little effort because trimming inches from your middle is almost entirely related to the quantity and quality of the calories your eat. Eating more lean proteins from low-fat Greek yogurt, fish, poultry, beef and beans in place of low-quality carbs has been shown to help banish belly fat. Strive to get 25 grams of protein at each of your meals to provide the optimal effects on maintaining lean muscle and helping to keep hunger in check. Filling up with fruits and veggies is recommended because the antioxidants and other bioactive compounds in produce make it harder to store calories as abdominal fat. Diets rich in added sugars are linked to abdominal obesity, so keeping soda, candy, baked goods and the vast majority of processed foods sold in supermarkets should be limited in order to The American Heart Association recommends no more than 6 tsp. of added sugars per day—equal to no more than 100 calories. Read these articles to help you slash sugar in your diet. Women who eat more of their grain servings as whole grains tend to gain less weight over time and have smaller waistlines. On the other hand, eating too many highly refined grain-based foods like white flour, white bread, and baked goods have just the opposite effect. Added sugars and other fast-burning carbs (white bread, baked goods) cause rapid rises in blood sugar and insulin spikes, which lead to a shuttling of excess calories to be stored as fat. Studies have linked increased ab fat with diets rich in high-glycemic carbs. Healthy fats are monounsaturated and polyunsaturated and diets containing plenty of unsaturated fats (like the Mediterranean diet) are associated with smaller waistlines while saturated fats are morel likely to be stored as harmful visceral fat. Beneficial unsaturated fats are found in nuts, seeds, avocados, fatty fish and vegetable oils like olive or canola oil. Saturated fats are found in full-fat dairy products, fat-rich meats and fried foods. Without losing excess body fat, crunches, planks or any other type of abdominal exercise won’t help you lose inches. What’s best for a trim midsection? In one study, University of Minnesota researchers reported that women who participated in high-intensity interval training lost more abdominal fat compared to those who participated in lower-intensity aerobic training. Always strength train to maintain and gain more lean tissue to boost your metabolism. To accurately measure your waist, a tape measure should be snug horizontally around your hip bones where your waist would be narrowest. Take the measurement as you exhale a normal breath of air. 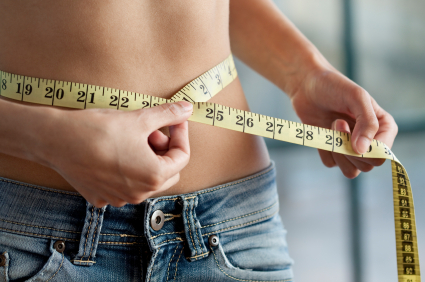 For most women, an inch off your waist is equal to about 5-6 pounds lost.